December 30, 2014 - by benign0 - 22 Comments. The search which, until the end of Monday, was focused over seven zones has so far yielded little. Reports of suspicious oily patches and objects being spotted by search crews have trickled in but the information remains inconclusive. 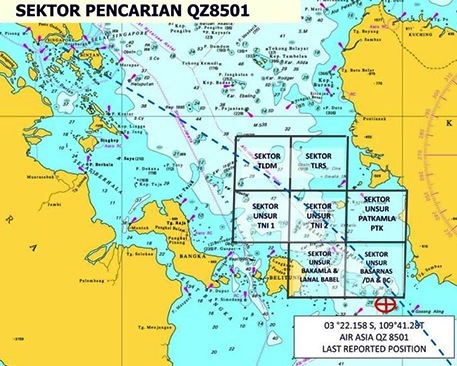 The Malaysian and Singapore Navies are covering the two northern zones, while Indonesian military and civil search teams are covering five others. The Indonesian government has formally requested the United States for assistance in the search and the US Navy Seventh Fleet is currently on standby as the details of the requirements are worked out between the two governments. Indonesia has reached out to the United Kingdom, France and the United States for help with sonar devices that may be needed for an underwater search, [Bambang Sulistyo, head of Indonesian search-and-rescue] said Monday. France has dispatched two investigators to Indonesia. They are due to arrive in Jakarta on Monday, France’s Foreign Ministry said. The missing plane is made by Airbus, a French company. China will dispatch aircraft and ships to participate in search and rescue efforts, the Chinese Ministry of National Defense said Tuesday. A Chinese navy frigate previously patrolling in the South China Sea was en route to the waters near where the plane lost contact, the ministry said on its website. The Chinese air force is also assisting with planning, the ministry said. The latest official assessment coming from an Indonesian official is that the plane is most likely to be “at the bottom of the sea” by now. Next Article Will Pope Francis’s 2015 visit to the Philippines bring out the best or worst in the Filipino? The latest I have heard is that land searches will be done as well. On social media, this accident lead to people believe that a new “Bermuda Triangle” has been invented /found (after MH370 has gone missing). It is the site called: the Devil’s Triangle. Some Japanese Reseach Vessels were lost there, some years ago, and never been found. There are reported activities of “Unidentified Submerged Objects (USO)”, in that area. USOs can travel in space and deep in the ocean. We are not yet, in that technology. USO? BAHAHAHA….. we all live in a yellow submarine…. We are not alone in this universe…there are billions of galaxies…like our galaxies.Maybe, by only a small probability, there is a Planet like the Earth in another galaxy…Ever heard of the Area 51 Research Center in Nevada desert, U.S.A.? Oh dear…. Guess that was lost on you. Is this related to those Vile Vortices? I guess there’s a triangle in just about anywhere around the world. Though there’s little information about that Devil’s Triangle, there’s a Devil’s Sea though. No just a vile oligarchy. Hmmkay..well there is vile oligarchy but I was talking about something else. Yes,that plane is at the bottom of the Ocean.That is exactly where it is. Does the term “alien specimens” bring chill to the bones? How come the Philippines isn’t contributing anything so much as a tugboat in the effort? Too poor to involve themselves to help their neighbors? When disaster strikes them lots of countries contributed to relief aid, Indonesia and Malaysia included. What an ungrateful country. The Filipino outstretched hand is only for begging…. This would highlight one thing: humanity hasn’t mapped the bottom of the ocean completely. It’s murky and dark in the water, so we don’t know what’s down there. And it’s hard to find stuff that goes in deep. Here’s where we see our limitations as humans. There is a Papal Planetary Observatory at his Summer Palace at Castel Gandolfo, Vatican. It is powered by powerful Zeis Refractor Telescope. Jesuit Priests Astronomers manned the telescope. Don’t forget to add showbiz to the mix. Filipino ShowBiz makes Filipinos Dull and Dumb. Most are nonsense and pandering for free money. And they are doing a really great job making the masses dumb and numb. That’s the problem, the same masses don’t like their minds getting poked, but when something intelligent tends to insult the “intelligence” of these same masses..they parade like a bunch of butthurts demanding for apologies. what about some idiot pinoy that claim this is karma for malaysia because of sabah. self-centered idiota. I haven’t seen anybody writing that yet, but if such a mentality exists among certain Filipinos then they’re no better at logic and reasoning than fundamentalists. a few comments from readers in inquirer, thankfully there are some sane comments around too. but still..